The Fred Harvey Company recruited women via newspaper ads from towns and cities across the United States. The women had to be of good moral character, have at least an eighth grade education, display good manner and be neat and articulate to work in his restaurants. In return for employment, the Harvey Girls would agree to a six-month contract, agree not to marry, and abide by all company rules during the term of employment. If hired, they were given a rail pass to get to their chosen destination. Harvey Girls were the women who brought further respectability to the work of waitressing. They left the protection and poverty of home for the opportunity to travel and earn their own way in life, while experiencing a bit of adventure. Quality lodging for passengers was an important part of the Santa Fe Railway system during the late 19th and early 20th centuries. As the railroad expanded west, a chain of hotels and restaurants run by the Fred Harvey Company opened along the Santa Fe rail lines. The hotels and restaurants were known as Harvey Houses, and they became famous for their quality food and service. The Fray Marcus Hotel located inside the Williams Depot was one of the original Harvey Houses, and was named after Spanish missionary Marcos de Niza, who explored the Southwest in the early 16th century. (The Fred Harvey Company often named its hotels after early explorers.) The hotel and adjoining depot opened to the public in 1908 with 22 guest rooms. In 1925, 21 additional rooms were added. Being in a town full of railroaders, ranchers and lumbermen, the Fray Marcus Hotel was a true diamond in the rough. It contained what was then considered modern amenities such as a lunch room, formal dining room, news and photograph room, and an Indian Room with a beautiful fireplace and cigar stand. There were even “Harvey Girls” to serve the rugged bunch. 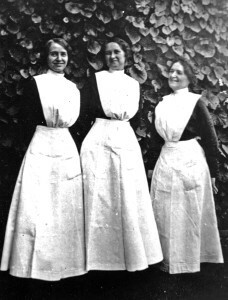 Dressed in their signature black and white dresses, the ladies brought some civility and charm to the frontier. Today, both the Williams Depot and the Fray Marcus Hotel are listed on the National Register of Historic Places, and the old hotel is no longer used for lodging guests. Parts of the original structure house the Grand Canyon Railway gift shop and company offices, while the historic depot is in use and open to the public. The current Grand Canyon Railway Hotel is located right across the lawn from the original hotel. The current Grand Canyon Railway Hotel was built in 1995 and was designed to resemble the historic Fray Marcus Hotel. The hotel opened as, and continues to be, the finest in Williams. In keeping with the reputation and tradition of the original Fray Marcus Hotel for quality and service, a 107-room addition was completed in early 2000, doubling the size of the Grand Canyon Railway Hotel. An indoor pool, hot tub and exercise room was also added, while a third renovation was completed in March of 2004, adding 92 rooms and 10 suites.